Looking for a side that goes with pizza? 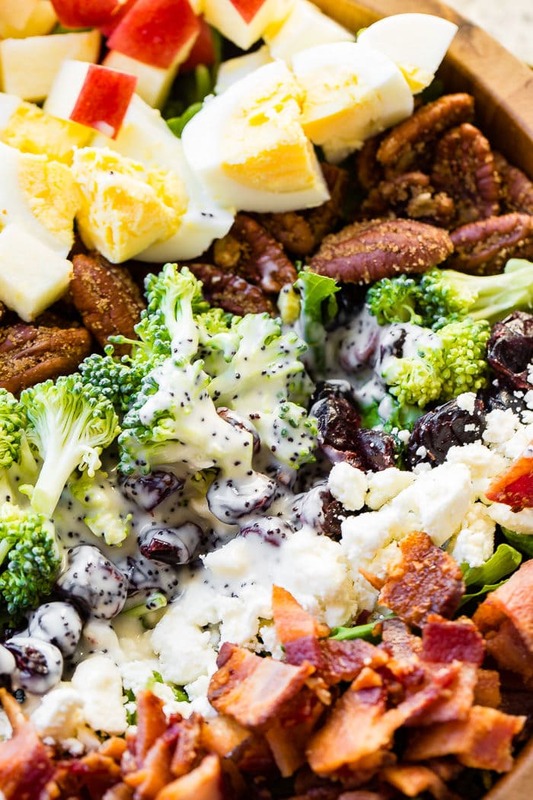 If it’s an easy dinner, but you need a balanced plate, try our Harvest Cobb Salad with Maple Poppy Seed Dressing. This is a sponsored post by Nestle Balance Your Plate. Everyone always says we must eat such amazing meals every night, but while we are food bloggers and we love making recipes, we are also busy, so sometimes it’s pizza or pancakes, am I right? 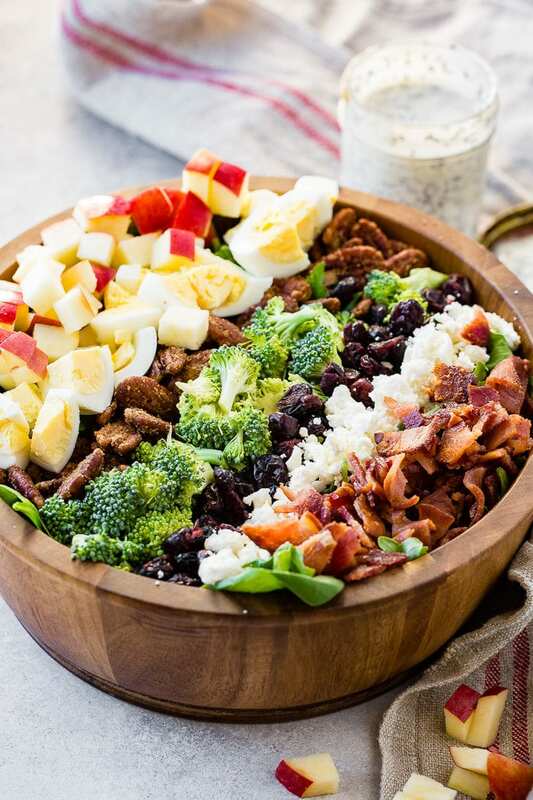 Our Harvest Cobb Salad with Maple Poppy Seed Dressing is perfect for those nights when you’re pulling out the pizza, and trying to be conscious about feeding your family what they need to have a balanced diet at the same time. I remember being in high school and feeling like I had no time to do anything. Fast forward to a college lifestyle and while I did have a blast the studying was beyond anything I’d ever done for sure. 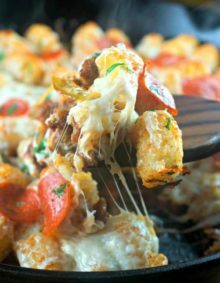 Pizza was a large part of my life in college, but I always felt a little guilty not having a fresh side dish to round out the meal. Now as a mom I’m even busier. 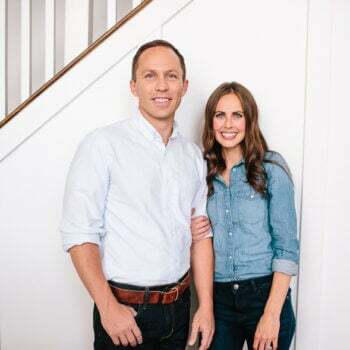 No one told me that being a mom would mostly consist of being a taxi cab, cleaning a lot and paying people money for all sorts of things from soccer camp to fixing things, and making sure my family is eating nutritiously. A little while ago I heard that research shows that Americans are only meeting MyPlate recommendations for vegetables, fruit, proteins, dairy and grains seven days out of 365. 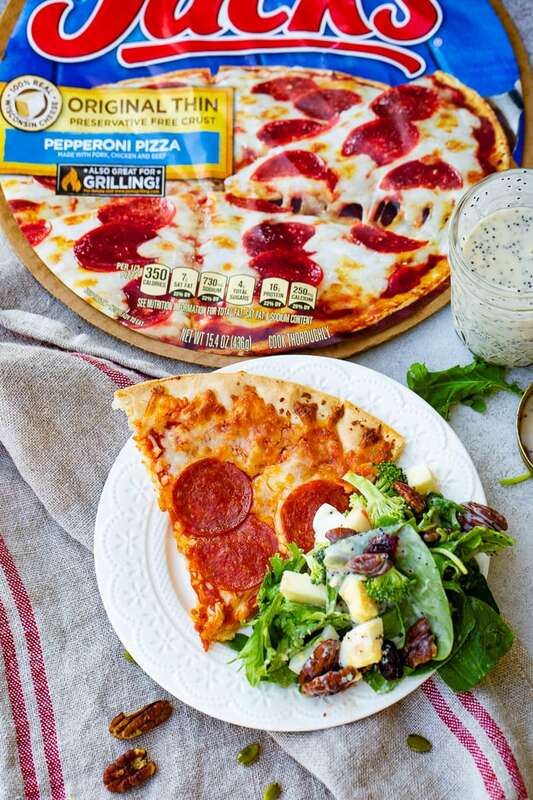 Listen, you don’t need to give up foods we all love, like pizza, to create a well-balanced meal. Things are for sure going too extreme with all of that. Having a nutritious diet is about being smart, not stressed. 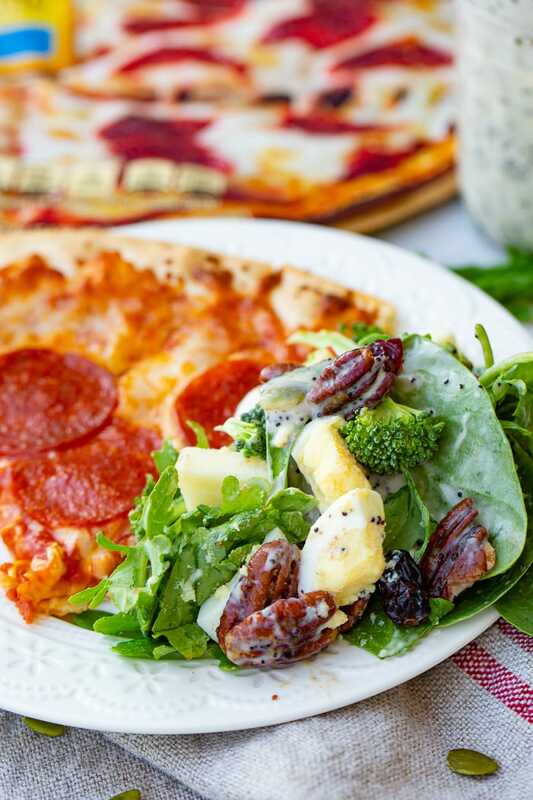 With thoughtful portions and a healthy side dish, pizza can actually be part of a wholesome, balanced meal, and you can rock that. Since Jack’s Original Line can be cooked on a gas grill in about 12-18 min—you can spend less time inside in your kitchen and more time outside in the beautiful weather with family and friends! Heck. Yes. Many people want to eat better, but need inspiration and simple recipes to get there. Amen. I’m so with you there, and in fact, if you’ve got some good ideas and recipes we would love, love, love if you’d leave them in the comments! 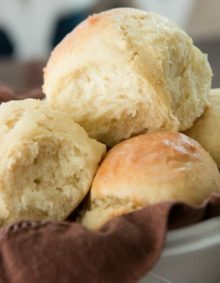 We know that making a meal from scratch is not realistic every night, and that’s where Balance Your Plate Educational Program comes in. Balance Your Plate is a program designed to help you put together nutritious meals that incorporate both prepared and fresh foods. How do You Stay Fit as a Food Blogger? For all of you who’ve been asking, how do you stay fit as a food blogger, this is a big part in who we do it. To create a balanced and nutritious meal, aim to fill half of your plate with fruits and vegetables. If you’re making pizza for dinner, good for you, you’re making sure your family is fed. 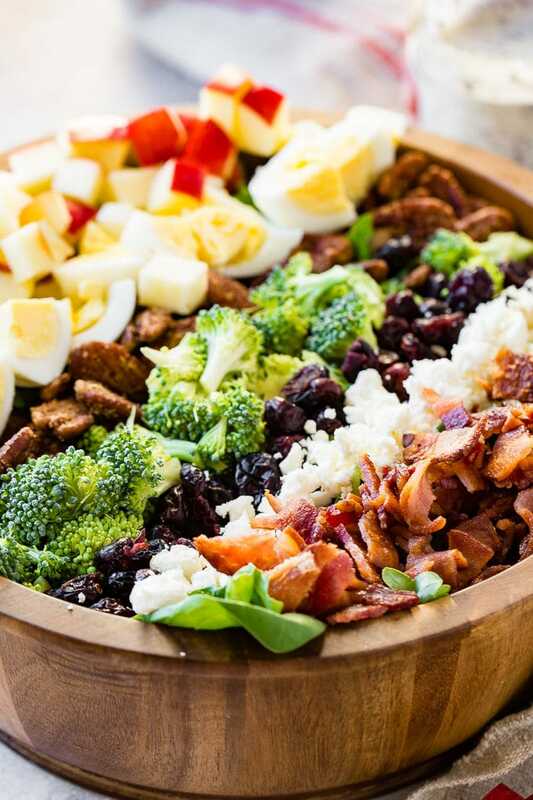 Throw a simple Harvest Cobb Salad with Maple Poppy Seed Dressing together to go alongside it and in a positive way put it on the table for the family. Try to avoid saying things like, you have to have veggies no matter what! It’s way better to just let the Harvest Cobb Salad or whatever veggie/fruit you pick be a natural part of dinner. If you’re worried about your picky eaters let us let you in on a little secret, BE CONSISTENT. That’s the key. Consistently put a balanced plate in front of your family and it will become a part, even habit for the meal. 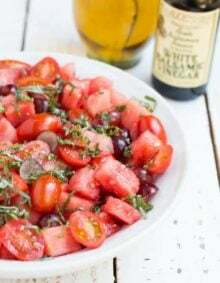 Looking for more side dish and salad recipes like this harvest cobb salad with maple poppy seed dressing? 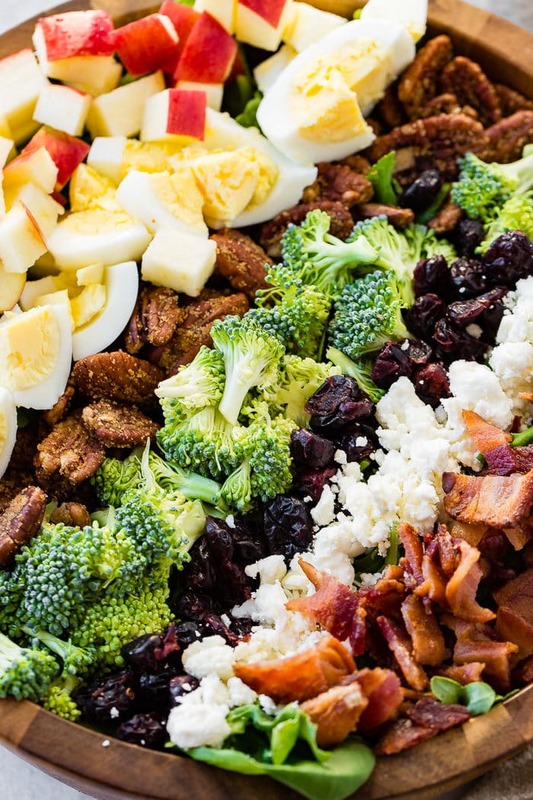 Southern English Pea Salad, Berry Salad with Lemon Dressing, Broccoli Salad, Teriyaki Chicken Salad, Pesto Veggie Salad, Asian Chicken Cranberry Salad, or this 7 Layer Salad! 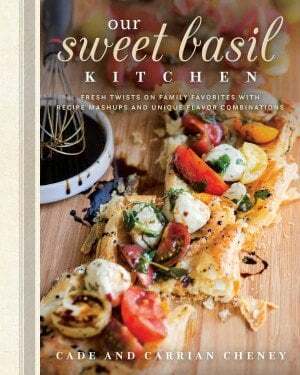 Looking for a side dish that goes with pizza? 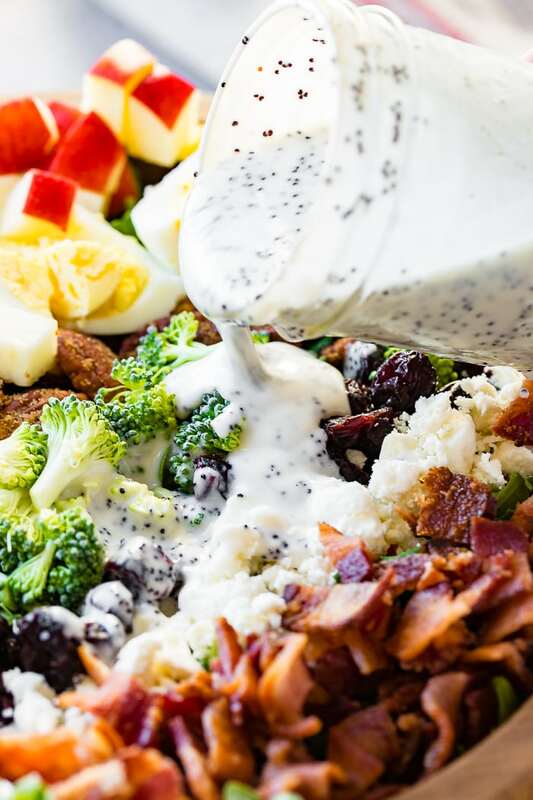 I'm all about a quick and easy dinner, but you still need a balanced plate which is why we love a Harvest Cobb Salad with maple poppy seed dressing. Whisk together mayonnaise, milk, maple syrup, cinnamon, apple cider vinegar and poppy seeds in a small bowl; set aside. Toast the nuts for a minute and add the butter, stirring until it's melted. Stir until the sugar is stuck to the nuts. 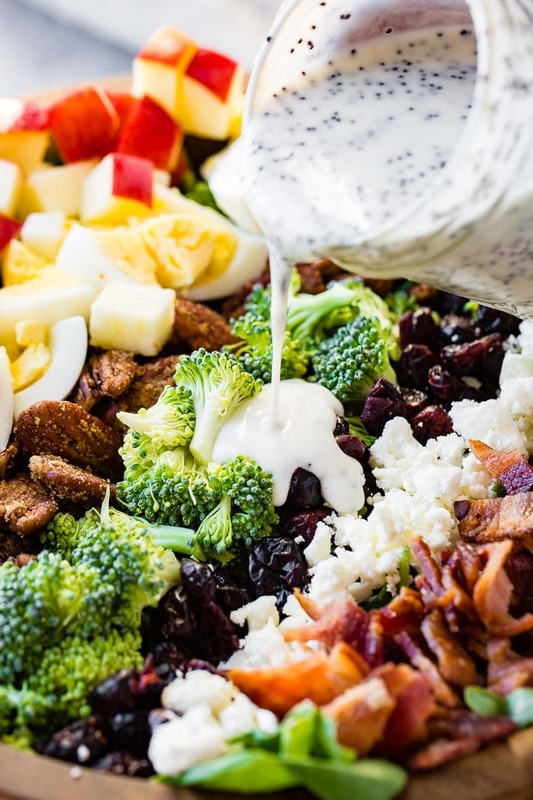 Place the greens in a bowl and layer the bacon, eggs, craisins, nuts, cheese, pepitas, broccoli and apple. 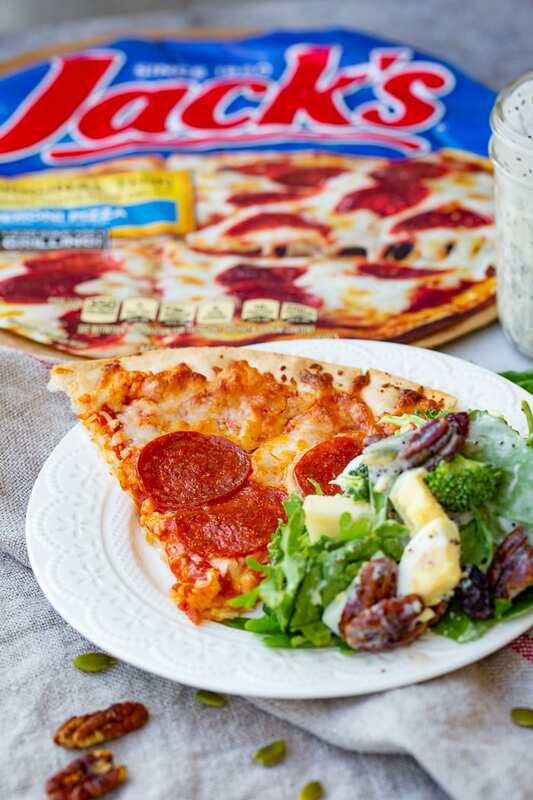 Serve with dressing as a side to your Jack’s Pizza.